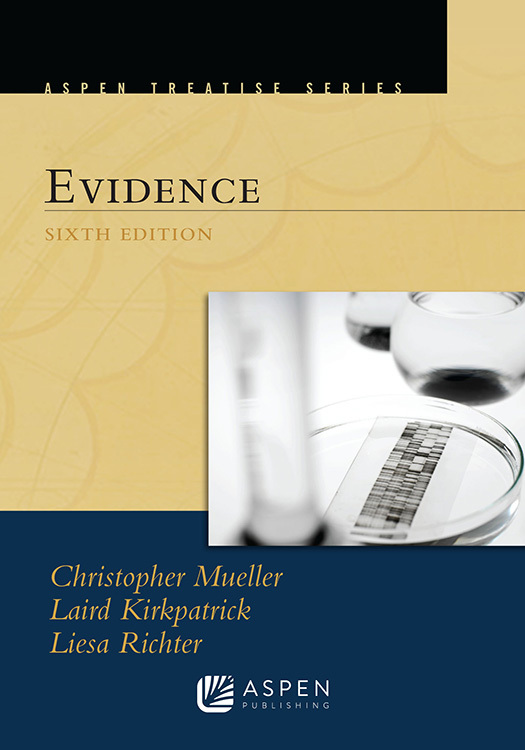 Evidence, Sixth Edition from the Aspen Treatise Series is the most complete reference on evidence law available, written at a level that makes it an accessible, indispensable resource for students. The text emphasizes contemporary judicial interpretations of the Federal Rules of Evidence, making the law relevant to students. Organization around the Federal Rules of Evidence makes the text particularly understandable, with common-law coverage given where an issue is not codified. Throughout the text, this student treatise features straightforward explication of the rules, analysis of leading case law, and thorough coverage of both the Federal Rules and state evidence codes. Pedagogical features include helpful marginal headings, mini-summaries of contents at the beginning of each chapter, generous footnotes, and useful case citations. The authors’ strong reputations as casebook authors and authors of Aspen’s practitioner Evidence treatise continue to attract users to this book. This text is also an indispensable resource for practicing attorneys, and students will want to keep their copy long after graduation. In fact, in addition to numerous citations by lower courts, two Supreme Court cases have cited the treatise: Schaffer v. Weast, 546 U.S. 49, 56 (2005) and Nevada v. Jackson, 569 U.S. 505, 510 (2013). Recent developments under the Daubert standard for admitting scientific evidence.